Twenty-five years after Keel’s major label debut (1984’s Lay Down the Law was released on the indie label Shrapnel Records) I am just now “getting” the band. I must have been crazy to never have taken to the band before hearing and loving the band’s other 2010 release: the all-new, all-original Streets of Rock & Roll. I didn’t realize how HEAVY Keel was. There’s a few songs here that would be considered “hair” material, but man, more or less this is a heavy metal album! Ron is really killing it on the vocals too… what a wailer! Guitarist Mar Ferrari really shines throughout the whole album as well. A true guitar god by his efforts on this album alone! Ultimately, The Right To Rock is a great “debut” that should be revered amongst fans of ’80s hard rock and metal and if you missed it the first time around or if you’re like me and simply haven’t gotten around to checking it out in the years since — now’s the time to do so. Of note for myself and other KISS fans is that Gene Simmons produced this record. From what I’ve read elsewhere, he also had a hand in writing “Easier Said Than Done”, “So Many Girls, So Little Time” (definitely a Gene title!) and “Get Down”. The Gene influence is easily heard on “Easier Said Than Done” which sounds like a throwaway mid-’80s KISS song right down to Ron Keel seemingly doing his best to imitate Gene’s vocal style. On this 25th Anniversary edition, in addition to the whole album being remastered we get a remix of “Easier Said Than Done” and a newly recorded version of “The Right to Rock”. The inclusion of a remixed “Easier Said Than Done” seems a bit unnecessary (maybe Gene talked them into doing it) but at least we’re getting something extra as opposed to many remastered releases that offer no bonus tracks. It’s interesting to hear and compare both versions of “The Right to Rock”. Maybe it’s due to modern technology, but the 2010 version seems more powerful and raw. Now this is what I’m talking about! 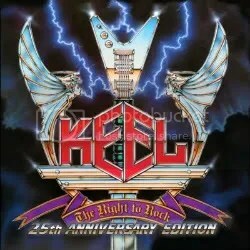 After nearly a 19 year absence (besides a brief reunion in ’98), Keel reunited in 2008 and the result is this masterpiece that hearkens back the good ol’ days of ’80s hair metal that doesn’t dwell or revel in the genre to the point of parody. Even the cover is a nod to the old school, using the same design of their 1985 major label debut, The Right to Rock. I’ve never owned a Keel album previous to this one. Of course I’ve been aware of Keel, but to be honest, they never really stood out for me when whatever I had heard from them (basically the same way I feel about Dokken). I knew this album was coming out though, so I listened to the sample of “Streets of Rock & Roll”. I wasn’t impressed and decided thought that maybe I had totally written Keel off. Well, when the opportunity presented itself to review this release, I figured, why not? Why not indeed! As luck would have it, Steets of Rock & Roll is a great release and I’m inspired now to seek out their previous albums. Back on topic, any hair/glam metal fan is going to like this release and I mean really like it. 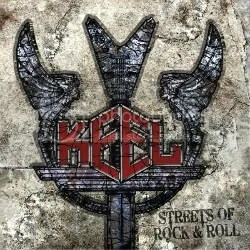 The production is great, Ron Keel’s voice is strong (he reminds me of Kevin DuBrow on “Hit The Ground Running”) and the album is just Keel being Keel. They aren’t chasing the idea of being trendy and getting caught up in sounding modern. If you told someone this album came out in 1988, they’d probably believe you and I mean that in the most positive way possible. There’s a great mix of melodic hard rockers and faster numbers here. “Streets of Rock & Roll” is a great way to start off the album — it’s melodic and affirms the band’s commitment to their right to rock while assuring fans what this album is going to be about. Then you have heavier and more up tempo numbers like “No More Lonely Nights”, “Brothers In Blood” and “Come Hell Or High Water” which really put you in that hair metal mindset and really give this album some bite. This is a must have for fans of the genre whether you’re familiar with Keel or not (I think I’m probably getting close to spinning this one ten times all the way through) and already we have a strong contender for one of 2010’s best releases.